In our series of letters from African journalists, writer Elizabeth Ohene considers why bodies are not buried for months, sometimes years, in Ghana. This past week there was another one of those typically Ghanaian funeral stories in the news. 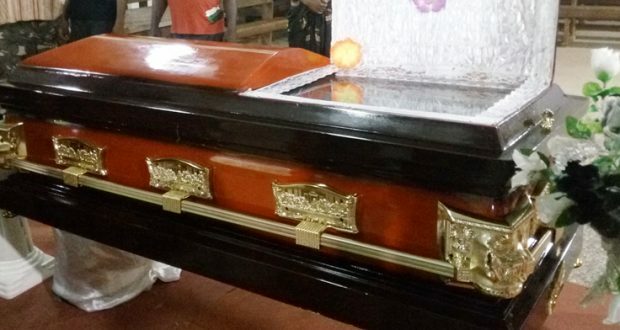 The body of a chief who had died six years ago was still in the morgue as the family bickered over who should be designated as the “chief mourner”. I was, as is usual with me, outraged. But the story did not attract much attention because we regularly leave dead bodies in the morgue for long periods to sort out the disputes that erupt after every death in this country. Our elaborate, expensive funerals and over-the-top dramatically carved caskets are well documented. In spite of the keen interest I have taken in trying to work out how funerals came to have such a hold on our society, there are some things that I still cannot understand after all these years. I have to keep on trying to find explanations. Take the role of the “family” in funerals for example. According to our custom and tradition, which has been upheld by the law courts, once someone dies, the body belongs to the family. You would think you know what and who constitute family, but once there is a death, the definition of family changes completely. A spouse and children suddenly do not qualify as family once there is a death. It is only the family, referring to the extended family into which you are born, that decides on who the chief mourner is and all the other titles that come with a death. This “family” and this chief mourner might not have seen or spoken for the past 30 years with the dearly departed, but they are deemed to know more about the dead person than the spouse and the children. There then follows the interminable meetings which are presided over by this “family”, where the word of the spouse and children can be ignored. It then takes weeks to draw up an obituary notice and it is an intricate business getting the list of the mourners in the right order. So the next time you see an obituary notice in a Ghanaian newspaper, you better be appreciative of the amount of work that went into drawing it up to ensure no offence has been caused and family feuds have not been started or old ones rekindled. The choice of the chief mourner is critical because he is not only in charge of the funeral, he, and it is always a he, never a she, has the ultimate word on who succeeds the deceased. All this while the body has to be kept in the fridge as there will be disputes about when and where to bury the dead person. Not surprising therefore that we often end up in court with injunctions preventing anybody from moving the dead bodies. Sometimes the delay has nothing to do with disputes. We take seriously the idea of giving the dead a befitting burial. We refurbish the house in which the dearly departed lived and died or sometimes a new house has to be built to be able to stage a spectacular funeral. If you want certain important personalities to be at the funeral, then a suitable date that would accommodate various diaries will have to be negotiated. This weekend, I was at the funeral of a famous industrialist and politician, Nana Akenten Appiah-Menka. His funeral brochure is a 226-page glossy production of photographs and tributes covering his life time of 84 years. That takes time to compile.